Campbells Grocery Products has invested more than £3 million in updating equipment, new R&D facilities, and a new pilot plant, development kitchens and office buildings at its Worksop plant. The utility consumption monitoring system has the capability to monitor specific production zones or discrete items of equipment. Campbells has acquired many well known UK brands over the last ten years such as Homepride, Fray Bentos, Batchelors and Oxo. Campbells uses a system to monitor utility consumption across five centres at its Worksop site. 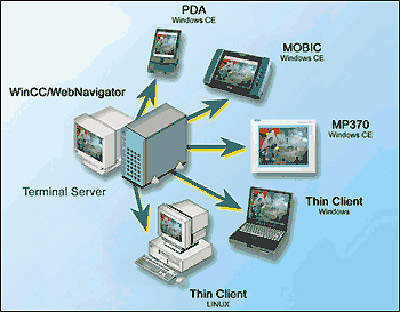 It has a web navigator which enables users to access the system from anywhere on site via the intranet. The Fray Bentos range of tinned pies is another well-known brand in the Campbells family. Campbells Grocery Products produce a wide range of soups and sauces at their Worksop plant. The company has been involved in an extensive update of equipment, manufacturing practices and working methods for two years and the process is now finished with Phase two completed in early 2005 (Phase one started in the second quarter of 2003 and was completed in April 2004). The company invested more than £3 million in updating equipment, new R&D facilities, and a new pilot plant, development kitchens and office buildings. The investment programme included extensive modification of each part of the process from sauce blending, pasteurisation, filling and packaging, to updating the software and control system, and associated civil engineering work. The modernisation and restructuring were deemed necessary for the company to increase the volume of products manufactured and to bring new products to market quickly under successful brand names. Campbells has acquired many well known UK brands over the last ten years such as Homepride, Fray Bentos, Batchelors (2001) and Oxo (2001) and their European business has a turnover of over £282 million per year, making it the largest food business in Europe. The Worksop plant has around 300 employees and new automation equipment and methods played a large part in the modernisation process. The company wanted to expand variety, reduce manpower and boost production. T Musk Engineering of Swadlincote, Derbyshire, UK, was one of the main contractors for the projects at the Worksop facility. Base Handling Products of Gwent, Wales, UK, was also a major contractor for the handling systems at the plant. Tetra Pak Processing supplied a new tubular heat exchanger for the plant. Industrial Control Systems advised on and installed some of the SCADA systems for the control of energy consumption. 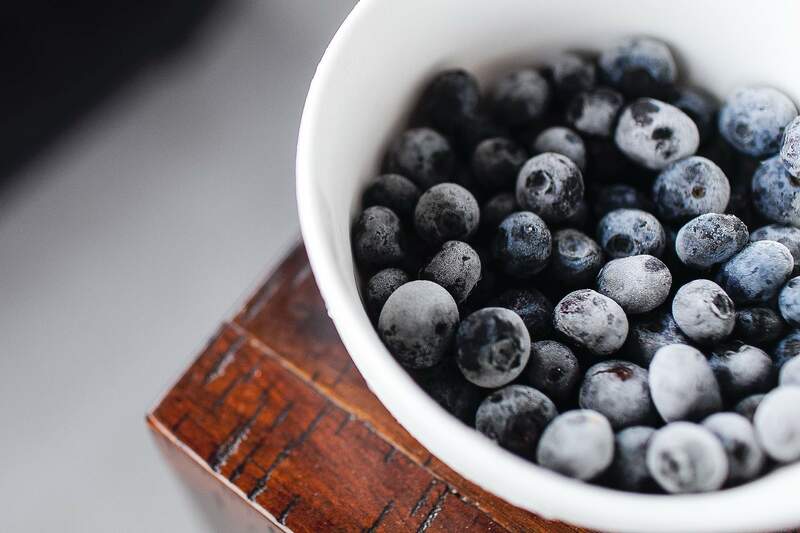 The previous manufacturing process was a problem since it could only handle 800kg bins of frozen ingredients and 100kg bins of canned ingredients. A new state-of-the-art handling system was introduced which increased production by over 30% overnight. Improvements in the handling system reduced the number of operators, and boosted productivity from a three-batch system to four batches every 20-minute cycle. Ingredients are now delivered in bulkier 1,000kg octoboxes, for which bespoke lift and tipping systems were designed and constructed. Where previously the plant could only produce sauces, it can now manufacture both soups and sauces. Base Handling Products designed, built and installed new hoisting and tipping equipment for the Worksop facility. 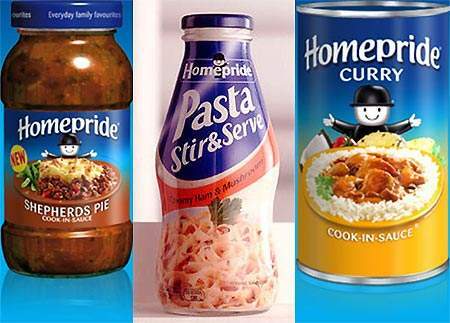 The seven machines were a key factor in the re-launch of the entire Homepride cook-in-sauce range, completely transforming the production process. Manufacturing various soups and sauces involves the loading and mixing of many different ingredients: from vegetables and meat to herbs and spices. Before the new equipment was introduced, only defrosted ingredients could be handled. The new machinery allowed frozen materials to be used, which speeded up the production process. There were also problems involved with the double handling of materials and damage to delicate ingredients. Campbell’s ingredients are either delivered in cardboard octoboxes (in the case of frozen vegetables), IBCs or as a tinned product. The new process of loading the ingredients into the cooking vessel, at a height of approximately 4.3m, had to accommodate all the ingredients. Four of the machines supplied by Base were double pillar mechanical octobox tippers, which have a lifting capacity of 1,000kg and a discharge height of 4,300mm. The main ingredient in most recipes is frozen vegetables, which are supplied in 1,000kg cardboard Octoboxes. These boxes are loaded directly into the Double Pillar Tippers, using a powered hand pallet truck, and tipped into the cooking vessel. The design of the tipper and its interface with the cooking vessel are such that 100% of the products are delivered into the vessels with no spillage. Most other ingredients are loaded into stainless steel octobins, which mimic the cardboard octoboxes and can therefore be lifted and tipped using the same double pillar tippers. In the case of the tinned products, they are first decanted into 200L tote bins and then tipped into the octobins using a single pillar mechanical bin tipper. The high value and taste sensitive ingredients are added to the octobins from a special purpose IBC platform and weighing system. A maximum of three 1t IBCs can be mounted on the platform. The contents can then be discharged directly into the octobin, which is placed on a mobile weighing platform directly underneath. The ingredients from the IBCs can be accurately metered out according to the recipe requirements, ensuring consistency of product quality and taste. The stainless steel Octobins are very large and unwieldy, so they presented a further manual handling hazard in the cleaning process. To solve this problem, Base designed and supplied their unique pneumatic tipper. This machine is used to tip the empty Octobin towards the hygiene operator, so that it can be washed out using a high pressure hose. A new tubular heat exchanger was installed at the Worksop R&D centre. Incorporated as part of the testing line for new products, the Tetra Spiraflo Type MT70 multi-tube exchanger is used for pasteurisation and heating and cooling for all kinds of liquid foods. The plant was supplied by Tetra Pak Processing and installed by T Musk Engineering. Campbell’s has started to take energy usage extremely seriously (because of the Climate Change Levy an environmental tax imposed on businesses). Campbell’s have been granted a rebate on the CCL providing they find ways to save energy and reduce pollution. The company now employs an Energy Manager at each of its facilities and installed a system to monitor utility consumption across five centres at its Worksop site, and with the capability to monitor specific production zones or discrete items of equipment. Industrial Control Solutions (ICS) recommended the Siemens Simatic WinCC SCADA package for the task. WinCC has a web navigator which enables users to access the system from anywhere on site via the intranet. It requires no PLCs; instead, the remote meters use a radio connection and then DDE links to add the data to the relational database on the system’s hard disc. Users can also input additional data via Excel spreadsheets. In 2006 the Worksop facility earned the EDF Energy Environmental Impact Award 2006 for its efforts in saving over 15,000 tonnes of CO2 emissions by switching to gas and also its overall environmental impact achievements. 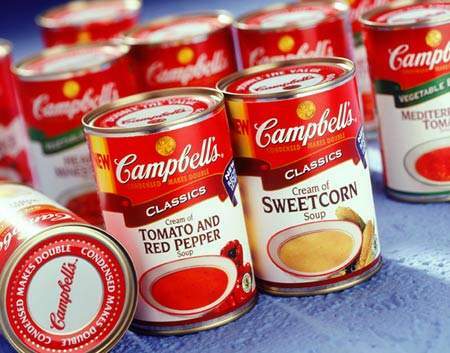 Campbells have now effectively pulled out of the European market citing poor profits in a supposedly expanding market. The effect of this has seen the Campbells soup brand disappearing from UK supermarket shelves to be replaced with the same products (recipes are the same) under the Batchelors brand. In addition, the well known Campbells meatballs range has also disappeared from UK supermarkets to be replaced by a new Fray Bentos meatballs brand from Premier Foods. 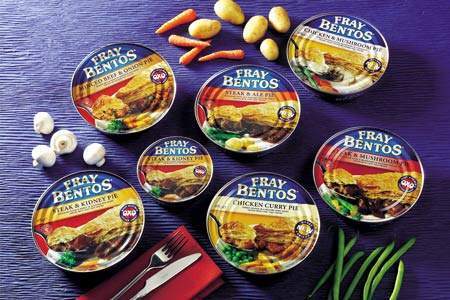 Fray Bentos dominates the canned meat ready meal category and accounts for a third of branded sales and a fifth of total sales. The rebranding of Campbell’s meatballs as Fray Bentos for Premier Foods has added more than £4m to its portfolio.